I was recently sent a review copy of Kanzashi in Bloom for the blog book tour and was excited to be included. I've known Diane Gilleland (author of Kanzashi Bloom) for at least two years now from her site Crafty Pod. As I've mentioned before here, I always enjoy craft books from blogs I read. You know what to expect and you have a little background about the author before you even pick up the book. I have always been impressed with Diane's creativity and attention to detail when it comes to her craft tutorials. So of course, I expected nothing less from her new book. Kanzashi in Bloom is based on the traditional Japanese art form, kanzashi. Kanzashi are traditionally hair ornaments made from squares of fabric folded much like origami. In the book you will find a more thorough explanation of kanzashi and it's origins. The chapters include, Origins of the art form, Materials and Core Techniques, Projects to wear, and Projects to give. 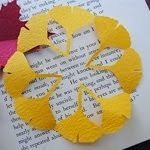 In the book Diane shows six different designs for the petals alone. There are 20 unique projects to create with the kanzashi such as hair accessories, earrings, Christmas ornaments, and more. What I personally enjoy about the projects is that they are contemporary and applicable for today's use. Below are a couple examples from the book. I tested out the petals in the flower above and was able to duplicate them with ease from the instructions. This was one of my personal favorite projects due to the beach theme and sandy colors. Along with showing you how to make the kanzashi star fish, Diane has a detailed tutorial on how to make the handbag. Please leave in the comments your thoughts about kanzashi and if you have ever heard of it before at the bottom of this post no later than Wednesday, August 5th, 2009. One entry per person. Please leave a way for me to get back to you if you win(enter your email address in the comment form). The email address is only used to notify the winner, I do not save the addresses. I'll choose one winner at random and post their name Thursday. Good Luck! The only bit I know about it is from Memoirs of a Geisha...and that might have been some other type of hair decoration. Ever since I visited my husband in Korea, I've been enchanted with Asian crafts of any kind, including cooking. I LOVE Kanzashi! When I was in University, I took a Japanese class. We had to do a research project for the end of the semester on something to do with Japanese culture, and I chose Kanzashi. They can be so intricate and detailed, yet also simple and elegant. I hadn't heard of kanzashi before but it's been mentioned on several blogs. I think it's uber cute and seems fun to do. Kanzashi is beautiful! My LYS just had a free workshop in kanzashi to promote this book, but I was not able to attend. That was the first I'd heard of it. I just heard about kanzashi the other day, while looking around the Dollar Store Crafts blog. The pictures from the book have an elegant casual feel. Very nice. I love kanzashi desperately. I went on exchange to Japan when I was in high school (10 years ago now, already!) and my host family insisted on spending an incredible evening dressing me up in three separate kimono, with complete kitsuke for each. The thing that enchanted me most was far and away the array of kanzashi. Ever since then I've tried to make my own about twice a year, but to no avail - I just don't have the knack, probably due to my low-level Japanese reading abilities. I really hope I win, but if not, I will definitely buy the book anyway. Thanks for posting on it! This is new to me but oh so beautiful. I would love to give it a try - fingers crossed. Anniversary, birthday, wedding gifts, cakes to Bangalore, Chennai, Delhi, Pune, Hyderabad, Kerala, Mumbai, Mithai Same day delivery to India, Gift Shop. this looks beautiful - it's definitely on my list of crafts to try now! I have never heard of this. It looks like it would be a lot of fun to try and a perfect craft for a group that will be visiting in a few weeks. So many different uses too! Kanzashi have been a love of mine ever since I started crafting. They're beautiful. Congrats to CraftyPod on her new book! I had never heard of it until this book hit the blogs. It looks fabulous. I've been recently making origami flowers to amaze my 4 year old daughter. I think this book would put me over the top in the best mommies of the world. I love them! So pretty. I had seen kanzashi before, but didn't know the name. Kanzashi is gorgeous, isn't it? I first really learned about it via Gaijin Geisha (www.gaijingeisha.com) some many years ago. I hadn't heard of kanzashi either until it started popping up on the blogs. It's just beautiful! I think it's beautiful and would love to try it.It's my first time hearing about it. I didn't know that was the name of it but I've seen them and admired them and they are on my to-do list. Would love the book! You are the first one to introduce me to Kanzashi - but it looks fantastic! My first baby (a girl!) is due any day now, and i'm sure i could make some adorable things for her using this technique. I've never heard of it before, but I love that headband, I can see me making them for my daughter. I've read about this before...and seen this same book popping up on blogs all this week... I think Kanzashi is lovely! The flowers make me think of yo-yos and I imagine they would be just as addicting to make and make and make! I had never heard of Kanzashi, but the headband is so darling! Thanks so much for the chance to win. I only just heard of Kanzashi since this book came out and the blog tours began. But it looks so fantastic and has been so wonderfully reviewed. I would totally love to try it because it looks so beautiful and seems so easy. I have only been exposed to kanzashi from what I have seen here on the Internet craft/blogging world. I think they are wonderful. I love the clean lines and fresh look of the kanzashi flowers. I've never heard of kanzashi, but those flowers are beautiful. i saw kansashi when i lived in Tokyo but only in store windows and for formal occasions. I like that Diane has given it an american vibe with more casual fabrics and simple designs. Looking forward to making a bunch. Figure out what to do with them later! 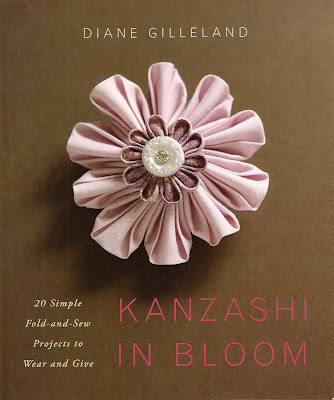 I hadn't heard of Kanzashi before learning of this book, but the fabric flowers and associated projects look like they would be a lot of fun to make and the finished products look absolutely gorgeous. Love Kanzashi! I worked as a babysitter at a Japanese ESL school until it closed. I was and still am facinated with these flowers and other crafts. Would love to know how to make them. I love anything Japanese, especially their crafts. Amazing talent and skill. thank you for the chance to enter! I've just heard of kansashi from reading about this book in other blogs. I'm going to have a buy a copy if I don't win it, what a fabulous skill to have! I have never heard of kanzashi before! So interesting! Love that flower headband! So unique! I'd never heard of Kanzashi before - but the simple, origami-like flowers are just beautiful. I first saw Kanzashi online and was intrigued. The book looks beautiful. I have studied Japan for a while (I just got my MA in East Asian Lang & Civ, woo!) but I never heard of kanzashi until I got to Japan - I lived in Kyoto for a year and a half and would always pass by this one little shop on Shijo-dori (4th Avenue) that only sold kanzashi. They were so beautiful and the fabrics and designs used to make them absolutely mesmerizing. I wrote a simple tutorial for one basic Kanzashi petal a while back, but I've never managed to go beyond that in complexity. I've thus got my fingers crossed, because I'd love some inspiration and more complex methodology to get me back into the craft! Love your blog. It keeps me coming back again and again. I love these flowers and hake never heard of this technique before. I really want to learn more! I've never heard of Kanzashi before, but so cute! I had not heard of Kanzahi before today, but yours is the second post I have read about this book. It is getting high recommendations. And I love the cover pic. Gorgeous! Thanks for the chance to win! I've seen photos on various blogs but did not know the official name Kanzashi. I'm into origami right now and this looks very similar. I had not heard of kanzashi before seeing this book on various sites but I'm definitely going to try it! I plan on embellishing overalls and jumpers for my granddaughter as well as making some barrettes for her. I can picture many, many ways to use the designs! Thanks for offering this book, it's absolutely wonderful! Hearing about Diane's book is the first time I've heard of kanzashi. But I love Japanese crafts. i've seen these a few times over the last year...i would love a copy of the book! i think they are fabulous! I had not heard of kanzashi until this book came out. I think it is beautiful and a lovely way to use fabric scraps that I cannot bear to throw away! Thank you for the chance to win. To be honest, no, I had never heard of it. But now I'm intrigued! Wow! I am familiar with many types of Japanese crafts but have never heard of kanzashi. But what a natural progression from origami. I loved making the yo yo flower garland from your tutorial. I love origami and this makes me want to make some hair ornaments for my daughter as I've recently become a little obsessed with the hair ribbon section of Etsy. Thanks for introducing me to kanzashi. Kanzashi are fascinating, aren't they? I'm not sure if the modern/western takes are really for me, but it's interesting to see how the form can be adapted, and I'm sure I could take some inspiration from these varieties. I've been wanting to learn to fold them for some time! I have never heard of that book but it sounds really interesting.I love making fabric flowers and things out of them, scrunchies, headbands, and even bracelets!!! I've never heard of Kanzashi before but it looks like fun. I have been drooling over some of these on Etsy for some time now. They are out of my price range so it would be great to make a few myself. I have never heard of kanzashi, but I love the japanese arts. It reminds me of origami, and I love the delicate look. I can't wait to see the book! Kanzashi is a new one to me but it is absolutely beautiful. 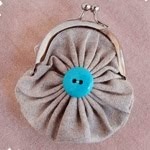 I would love to learn how to make some things to adorn tops, bags, etc. the tote is very lovely! I had no idea those little flowers were "Kanzashi" or that something by the name of Kanzashi even existed! But I have been dying to know how to make the little flower pictured on the headband and the ones on the beach bag as well. I have been drooling over them in the form of little girls hair clips on ETSY. I did make a hair clip (I may have mentioned this before) out of a fabric yo-yo, per your recomindation! Thanks for doing a giveaway and thanks for mentioning this book, I may have just have to pick this one up! i have never heard of it....but i'm loving what i see! I've never heard of it before. It reminds me of origami, which I think is fun. I don't sew very well so I'd love to give this a try! I've seen kanzashi before on different websites and since I love anything that looks like flowers, I'd live to give it a try - just haven't done so yet. I have never heard of Kanzashi before, but it is lovely and intriguing. It looks like it would be easy to learn. What a cute way to make and give gifts. I love kanzashi. I only know what I learned from watching the extras (and the movie) from the movie Memoirs of a Geisha. I know that maikos wore longer kanzashi ornaments and geisha wore shorter ornaments (or is it the other way around?). I've never tried making any but I would love to. This is also my first time commenting but I've been checking out and reading this blog for a few months now. I'd never heard of kanzashi prior to Diane's book release, but let me tell you - I'm totally smitten now! i have never herd about the name of this art. but i have seen many times in japanese craft books this tipes of flowers. and i even made one my self. but without realy knowing about the whole art around it. This is my very first learning of Kanzashi. But, I already know that I am in-love! Thank you so much! I love that tote, it's gorgeous! The book is high upon my list of books I want to read. I can't wait to try the ideas in it! I've never heard of kansazhi, but am a HUGE fan of origami. My best friend and I stared doing origami when we were in 5th grade, and I still continue to this day with my little cousins and neices. In fact, just a few months ago I made an elephant for my 9 month old daughter, and she loved it! I'd love to try kansazhi since I just started sewing again, and the book looks fabulous! Beautiful Ideas! Sets my creative juices flowing just looking at the pictures. I had never seen this kind of project before Sister Diane's book hit the blogs. I had seen these flowers at my friends house who is from Japan.The flowers are so beautiful and delicate...being a crafter would love to have this book and make some for myself and gifts. This looks so cool! I hadn't heard of it before but want to try it now! I'd never specifically heard of Kanzashi but my best friend, who is getting married, instantly came to mind as she's trying to go for less "weddingy" decor/attire. I love to make crafts and love Asian flare. I had already used your tissue paper flowers for a couple of project, these would also be so nice to add simple decor (her shower! )to a look or an item or a head piece. Very cool! I'd never heard about Kanzashi before but I'm rapidly becoming a fan. The little flowers are adorable--I knew there was a reason I've kept itty bitty pieces of quilting fabric! I first heard of Kanzashi from Craftster. I loved the look of it. I've wanted to try it for a few years now. What lovely flowers. I would like to win as I have four granddaughters who would learn with me as we work on the Kanzashi projects. I have never heard of Kanzashi. What fun. Wow, these are amazing! I have three little girls and I keep looking for the perfect fabric flowers to make to accessorize their outfits. these would be perfect! I have never heard of Kanzashi before, but it looks like something i would love! I've always thought kanzashi was right up my alley. Sort of zen-like, with those little bits and pieces, everything about it strikes a chord with me. Repetition, handwork, scraps, fabric, the delicate nature. Love it, would love to have the book. Thanks for a chance! I had never heard of kanzashi until I saw this book at the store. I would love to make some hair clips for my daughter. Oh how I would love this book - fingers crossed! Kanzashi really appeals to me. 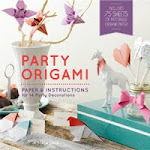 I love doing origami and tiny fabric projects and I've seen so much kanzashi here in Japan but never knew how to do it! Great that you are doing a giveaway! I have never heard of it before but I'm definitely going to check it out. Love that headband. I have never heard of it before. But the flowers look very intricate and beautiful. Definetly something I would like to try. I have only admired Kanzashi on the internet. There is an Etsy seller that makes the most beautiful kanzashi. I use to enjoy seeing her creations. I have always wanted to know how to make them. This is such a beautiful book. I would love to win a copy. I had never heard of Kanzashi until this book started showing up in the craft world blogs. its beautiful! my mom is currently working on a crazy quilt and these little gems would be perfect suprise for her! Kanzashi is new to me, but I would love to give it a try! I have only started seeing kaknzashi with the publishing of this book and it looks so fun. I would love to get a copy! I'm up for any craft I can do in carpool! I wish that I knew more about kanzashi and more so, I wish I had time to learn how to make something that delicate looking. I've heard of it from my artistic friends and maybe now they'll teach me! I can use this in so many ways. One for my nerves, two to teach my autistc son and three to teach during the cultural fair at my school so 800 kiddos will benefit. I heard about it once on Craftster. I really love what I've seen of this book. Thanks for offering the giveaway! I have seen these type of things before. I would love to try and make a few. thanks for this opportunity to win. I have never heard of Kanzashi before. I would love to win that book. I had never heard of it before, but my neighbor and I get together and do origami. We would love, love to do something similar with fabric so that we could wear our creations! before seeing this book, i had never heard of kanzashi. the flowers are delicate and lovely! I have seen kanzashi on several blogs I follow ... I would love to learn how to do it myself. Thanks for the chance to win. I think it's a very nice design, and I know my friends would love to learn how to make the crafts since they make cosplay outfits for anime conventions. I hadn't heard of the term before, but I have seen the design several times this year. 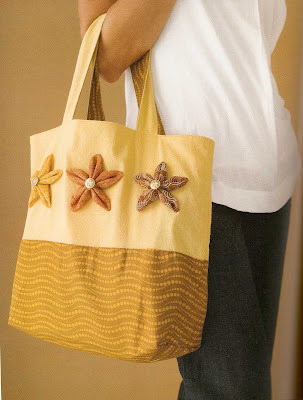 I've never heard of kansashi, but I love that star tote. Kanzashi seems like a unique craft to try; I've never heard of it before. Thanks for the giveaway! I know nothing about it, but it looks neat. Kanzashi is new to me. The Japanese have such beautiful ideas! Hi I love your Kanzashi now that I can actually SEE it. I heard you on Sirus on Martha Stewart the other day..thought it was funny they asked you to walk them through it!! I will be sure to pick up your book since I can't sew but keep buying fabric!! I have seen this book all over the place lately! I had never heard of these sweet little flowers before this book, and I sure hope I get a chance to try them out! I had never heard of Kanzashi before this book but it's beautiful. i love making kanzashi's!!!! i use then in my hair, in my ears, on t-shirts!!!! i heard that kanzashis were very important for the geishas, and i saw some pictures of their hair ornaments.. lovely!!! I have never heard of this technique before. I certainly am interested in pursue this further. Wow, I've never heard of it but I love it! Oh, so pretty! Yes, I saw lovely examples of this art when I was in Kyoto last year. Wish I were there again! Thanks for the giveaway. I love kanzashi. i'm so glad to hear there is a book out and it looks delicious. I'd never heard the word Kanzashi before, but I love the look! I have so much fabric lying around just waiting for a new craft project. Thanks for the chance to expand our minds and handiwork! I've also seen some mind blowingly gorgeous pictures of Kanzashi that just make me drool! I have never heard of kanzashi bot it is very pretty work that I wouldnt mind owning. I just recently bought a kanzashi hair ornament on Etsy for the obon festival--and I immediately wanted to make some of my own. I heard about this book on Amazon and am so curious. Thanks for the contest! I hadn't heard of kanzashi before but it looks very cute. So pretty! Never heard of it before now! I have never heard of Kanzashi before, but I would love to learn more about it. It's so neat! Beautiful! I haven't heard of it before this, but I'd love to learn more. I had never heard of this! I have never heard of kanzashi till now but would like to win and learn more! I haven't heard of it before. But this book looks lovely, and I love to make things, exspecially pretty things, so I would love to win this. No, I have never heard of it, but the designs are darling. I'm certainly glad that I have now. Thanks! Lovelyflowers! I have read about this book in lots of blogs but really didn't know about the author or the projects and I am amazed with them! I have never heard of this before, but it is really cool. I love how creative it is and beautiful! I've never heard of Kanzashi but it is so beautiful. I have never heard of Kanzashi before, but it is very pretty! Thanks! i'd never heard of it but i love wearing flowers in my hair, i want to learn this! This blog post is the first time that I've heard of kanzashi, but it has definitely caught my interest. Please enter me in the giveaway. I've never heard of it before today, but it sounds awesome! Thanks for the chance. I have never heard of kanzashi before now but these are really beautiful and I'd love to learn more about it! I've never heard of kanzashi,but I love them, very nice. I have loved kanzashi for years now. Never heard of it before, but it looks beautiful! This is the first I have heard of kanzashi but I have already fallen in love with these little flowers. Thanks for the giveaway. I've never heard of it before I read your post, but they are beautiful! This is the first time I've heard about kanzashi. I've never heard of kanzashi before but the examples of it you show are very pretty! Pretty awesome giveaways.Thanks for sharing.